We made a road trip to the college campus to celebrate Cassie's 19th birthday by grilling out. It was a wonderful day to celebrate!! Open flames are not allowed in the dorm buildings. Outside it was too breezy to keep the candles lit on the cake. We gave up and sang 'Happy Birthday' as Phil tried to keep as many candles as possible lit on the lemon poppy seed cake. If you click on the cake you will see that some of the candles never lit. A shovel was brought out from the truck and a walk space was described around the college provided Webber. Ceile (sp) is a new and dear friend Cassie has made since moving to school. She makes sure Cassie gets to and from church on Sundays. This has been a blessing this Winter with the constantly changing variations on Winter. Bitter cold, sleety, foggy.... sometimes all on the same day. Phil and Cassie and Matthew couldn't resist the occasional snow ball lobbed at one another. There are no pictures of that. 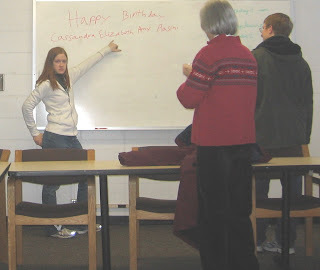 What a great day for a birthday celebration. The sky was clear. It was cold enough to keep the snow on the piles and warm enough to go about without a hat. Above Larry is making a trip to the truck. Below is a very happy Matthew standing under the picnic area. Phil agreed to do the grilling. 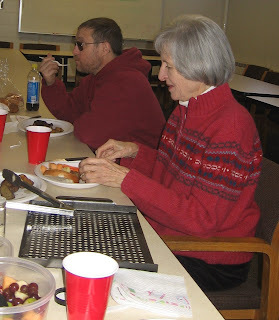 The rest of the crew gradually found their way to a conference room for the feast. This is more party. 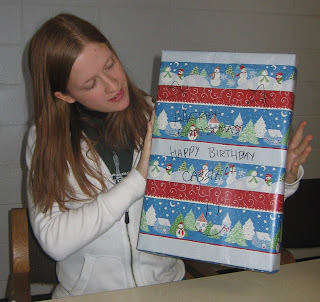 Phil, always creative, wrapped his gift in Christmas wrap. A recent theme is turtles. Cassie is most cooperative. 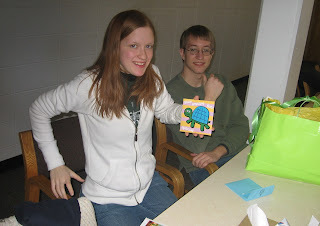 Turtle card. Turtle jama bottoms. An alphabet fleece blanket in the bottom of the bag with, of course, T for Turtle. Below is Larry, today. It was warm enough to get under the packed snow/ice before the next great white death. Both he and Matthew took a tumble yesterday on the ice walking from the dorms. One good thing about Winter. Even if you slip on the ice the jackets pad the landing. Larry came home from work this morning and played in the snow. I took pictures from the stoop. He took the camera and took pictures from the street and driveway. 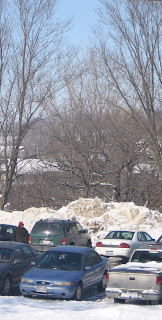 Yes, the snowbanks are that tall. The iron pipe holding up the mail box since before we bought this house rusted through. The mail box is now resting on the snowbank until Larry can find a way to prop it in the remaining pipe until the frost is out of the ground. 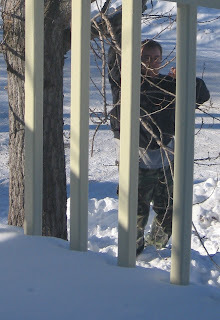 Phil showed up a little bit later and decided to see what he could do to the tree. (below) I was fast enough to catch the event from the upstairs. I took the picture above because of the sublimation of the snow on the railing. It is pretty and should be gone with tomorrow's new snow. Phil found a flat near campus with 2 other guys to sublet through the end of July. Plans became a little skewed when the gal he is subletting from misplaced her cell phone and connections could not be made. Phil drove down to see what was going on. We drove the loaded explorer and trailer down to meet him once Phil made sure the move was on. It was snowing, again. On the @ 20 mile round trip journey we saw a number of vehicles that had managed to end up on top of 3 foot snowbanks. Phil made 2 more trips between the flat and here. Today he stopped by to visit. This is one more variation on snow. The ground was wet and slushy yesterday, and almost snow free. Today the snow from the sky is just around freezing.... wet and heavy. The numbers are everywhere from 10" --> 10' by the time the snow is over. #### is supposed to freeze over by the weekend. The pictures were taken around noon facing the South (for you precision people). One minute the sun is out. The next minute it is snowing sideways from the gusts of wind. I do not hear the wind in the house. It must be a combination of old fashioned storm windows and the pine trees that cut the wind, grown throughout the neighborhood. One picture was through the kitchen window. The next was the snow sticking to the porch door. I pushed the door of the upper porch open to get the third picture, hoping to capture a snow devil off the garage roof. The last picture is the snow I had to push out of the way to take the picture from the upper porch. I know... cliche's. This will seem like a foreign planet when I look at this post in July. Odd, Odd Winter. It snows. It melts. It ices. It snows. It melts. It ices. It blows and snows. It freezes below 0°F. It melts. And...... just in case you missed it. It snows. 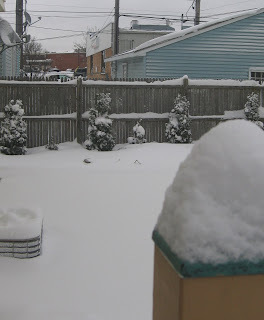 I read the Laura Ingalls Wilder books as a child and wondered about snow as high as the top of a door. I remember coming home from high school walking in the ruts made by the cars in the street. Larry and I walked to a new years eve party and hid from the cold wind behind the snow banks the year we met. Is God sending every possible variation on Winter to our world this season? Today was a good day to not drive to work. The news was full of jack knifed semis and spun out cars in the ditch. It is no longer a challenge to my skills. It is enough. 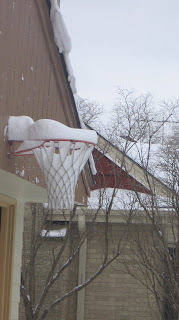 Above is the basket ball net holding last night's snow (1-3" predicted). Below is the yard. This was not 1-3". It is still snowing at 11:20 am. Even so... I would rather snow than 90° and humid. At least I can go outside in some comfort, and it matches everything.